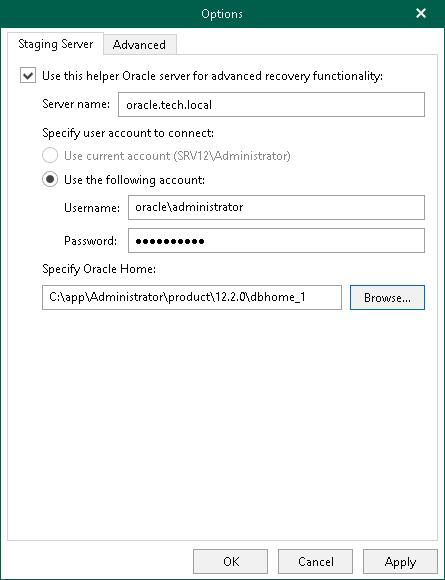 This section explains how to configure a staging Oracle server which is required if you want to use a point-in-time restore to revert the database to a state before an undesired transaction or before a point of failure. A staging server is also required when exploring backups created without application-aware image processing. For more information, see Exploring Oracle Backups. A staging server must have the same Oracle version as both the source and target Oracle servers. If you plan to restore databases with Automatic Storage Management enabled, both staging and target servers must have ASM enabled. Oracle Database Express Edition cannot be used as a staging system. 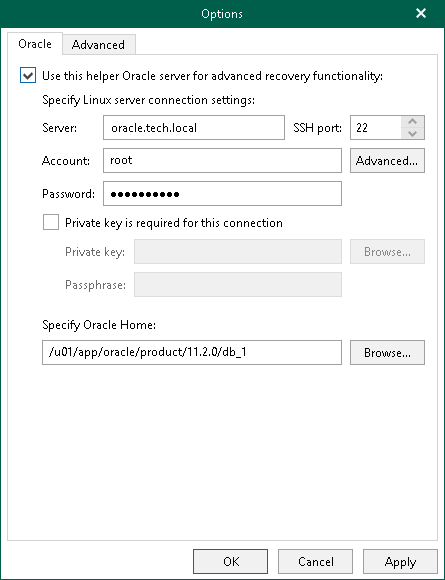 Go to the Oracle tab and specify the server name to which you want to connect. Specify a user account to connect to the Oracle server that you want to use as a staging system. Specify the path to the Oracle Home folder. Click Browse to find the associated folder automatically. Go to the Oracle tab and specify the server name and SSH port. Specify a user account to connect to the Oracle server that you want to use as a staging system. The account must be a member of the dba group. 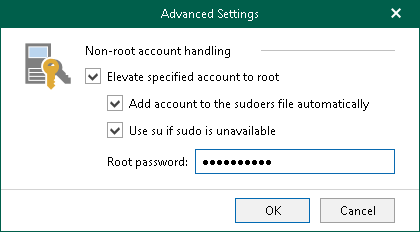 To elevate your account to root and to add it to sudoers, click Advanced and select the option you need; if necessary, enter the root password and click OK.